The tiny town and its surroundings are dotted with several historic sites of different periods. In this historic town rest the tombs of 80 Swiss officers of the Swiss de Meuron Regiment who fell in battle, or were felled by disease and the vagaries of nature? Centuries ago, men crossed frontiers considered sacrosanct to defend their honour, to even fight as mercenaries and did not mind living and dying in foreign lands as long as it served their ideals and their needs. But who could have imagined that a regiment of the Swiss, from a peace loving country which has endeavoured to remain neutral amid all the bloodletting and tortuous wars, lived, fought and died in our own Srirangapatna, near Mysuru? That in this historic town rest the tombs of 80 Swiss officers of the Swiss de Meuron Regiment who fell in battle, or were felled by disease and the vagaries of nature? M.B.GIRISH travels back in time to trace the lives and times of soldiers of a different age, who have been forgotten in the land they fought but are still remembered and revered by their progeny, who have not hesitated to make the trip from faraway Switzerland to Srirangapatna to restore these graves with love and devotion. The town of Srirangapatna has undergone many a transformation since its birth 1,200 years ago when it was the Mysore dynasty’s capital. It later became a military outpost and then an operational garrison and is presently, a famous pilgrim site because of the Ranganathaswami temple located on the banks of River Cauvery. The tiny town and its surroundings are dotted with several historic sites of different periods. There is Lal Mahal belonging to the erstwhile ruler of Mysore, Tipu Sultan, his, armouries, mosque, and the moats of the old fort among others. 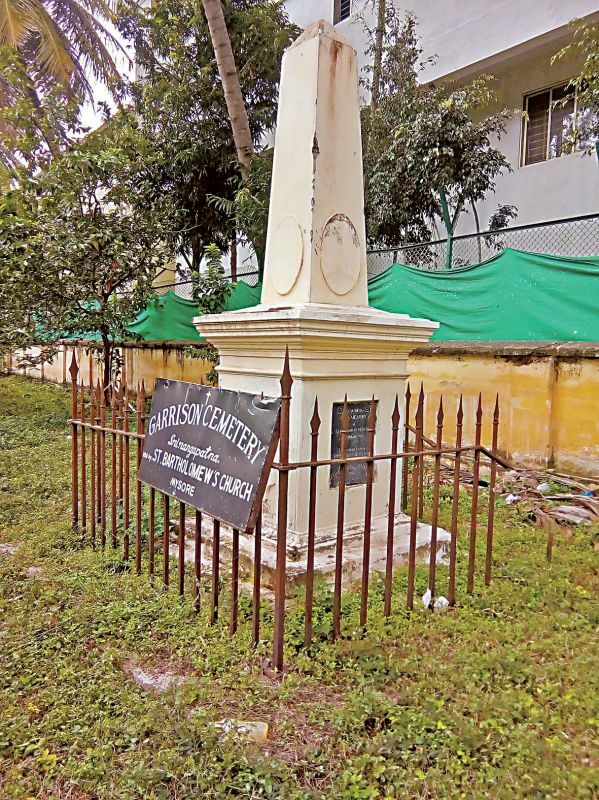 One among these historic sites is the Garrison Cemetery a burial ground of Swiss officers which tells the poignant story of army officers of various ranks, and their families who lived at Srirangapatna and were later buried here. Among those buried are the 80 officers of the Swiss de Meuron Regiment, founded by Charles-Daniel de Meuron, and their family members. In fact the British Garrison along with the Swiss Regiment stayed at Srirangapatna for a considerable length of time during which many died due to malaria and other tropical ailments. From outside, the Garrison Cemetery looks like any other burial ground but a closer look at the tombs and the names etched on them is enough to remind any visitor of a stormy period in history two hundred years ago when the forces of Tipu Sultan and the British fought the bitter fourth Anglo-Mysore War at Srirangapatna. Tombs of British and Swiss soldiers and their families who stayed at Srirangapatna at the time of the Fourth Anglo-Mysore War. 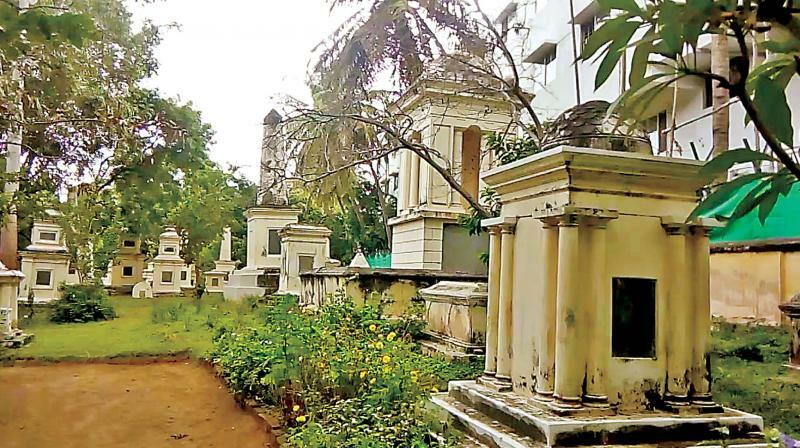 The cemetery is spread across three acres of land, off the Mysuru-Bengaluru Highway near a checkpost at Srirangapatna and can be reached via a narrow path from the highway behind a private school, or through a road leading to Krishnamurthy bungalow. There are no signages and so any visitor has to depend on the help of local people to reach the cemetery. An old fashioned wooden gate with a heavy iron lock attached to it still remains while the compound wall of the cemetery has a stone engraved on it to indicate that this is a burial site with tombs from 1800 to 1860 AD. Someone has done restoration work here which is evident from the newly grown ornamental flowers and in their midst, the several burial sites and tombs of various sizes. This burial ground falls under the Department of Archaeology, Heritage and Museums and is on government land. Records say that Le Regiment de Meuron, a Swiss mercenary unit, served the Dutch East India Company in Ceylon and Sri Lanka. But the inability of the Dutch East India Company to pay their wages in 1795, made the regiment negotiate with the British East India Company and 800 men of the Swiss Regiment joined the British East India Company. The regiment of the Swiss was divided into two battalions of five companies of infantry each, under Lieutenant Colonel Wellesley. In 1799 AD, during the Fourth Anglo-Mysore War, the regiment was chosen as the storming party against Tipu Sultan’s defending army at Srirangapatna. Emerging victorious from the war, the de Meuron Regiment remained in India until 1806 AD and served in several campaigns. Some of them died and their tombs now dot the Garrison Cemetery-those of captains, colonels and lieutenants in different sizes depending on the ranks they held in those days. The tombs were constructed using bricks and mortar with stone slabs attached to them specifying the names of those buried, their designation and the date of death. “Some of the tombs resemble the Greek style of architecture,” say officials. There are even tombs built in the Brindavan style resembling Hindu architecture. There are also places where all members of particular families are buried. But owing to lack of maintenance, some of the tombs started to tilt and got damaged. There is no one here to attend to visitors particularly those who come from abroad with the site covered with guava, mango and other fruit bearing trees. Not much was done to help visitors identify the place with ease and also clean up the vegetation. Having heard about their courageous forefathers, Louis Dominique made several trips to Srirangapatna with his wife Monique de Meuron to locate the cemetery as he was determined to restore it to its original glory. The couple met Mysuru conservation architect Ravindra Gundurao in 2002 and commissioned him to undertake the cemetery restoration work with the approval of the archaeology department. Director of the department Venkatesh Machaknur too took special interest in the restoration of the cemetery and provided valuable inputs. The late Dr M.S. Nagaraja Rao, former director general of ASI along with Dr Gayathri, retired deputy director of the department, were in the advisory committee to restore the cemetery which was redone to its original state in 2007. The de Meuron family has continued to be involved in its upkeep and repair when the need arises. There are 309 tombs and only nine of them have members of the de Meuron family. After Louis Dominique and Monique, their son Jean-Leonard and daughters Sophie and Heloise have felt the same emotional connection with the Garrison Cemetery and have enthusiastically backed the restoration effort which has been taken up again. Support has also been forthcoming from the British Association for Cemeteries in South Asia (BACSA) a London-based voluntary organization represented by Mrs Phillida Purvis and Jeernodhar Conservation Private Limited, a specialist restoration agency in Mumbai, which are undertaking the latest round of restoration work. History is replete with tales of bravery and sacrifice, of battles for land and pride to make sure one’s name is not forgotten in the long course of a hundred or thousand years. Countless Indians too have died on foreign soil, in Africa and Europe like the Swiss did in Srirangapatna, for they believed their cause was worth fighting and dying for. 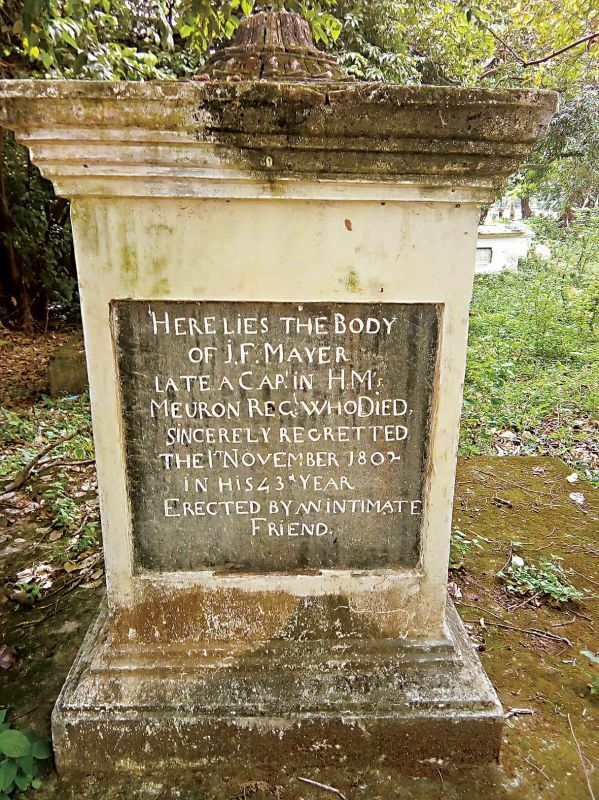 In an age when people are running out of causes, when valour and sacrifice are rare to find, the Garrison Cemetery in Srirangapatna and the Swiss effort to restore the tombs, should be enough to remind everyone that a nation and its people live and thrive on memories, on lineages and causes and can hardly afford to neglect them.